Ahmadiyya movement in Islam was founded by Mirza Ghulam Ahmad in March 1889. He was born in Qadian, Gurdaspur District, British India in 1835. He proclaimed that God had ordained him that whomsoever seeks true faith and piety should pledge allegiance to him. Ahmadiyyat is not a new religion according to Ahmadiyya beliefs but represents the essence of the pristine Islam in all its purity, as enunciated by the Holy Prophet Muhammad, peace be upon him. Mirza Ghulam Ahmad declared that in fact he was the ‘Masih Mau’oud’ (Promised Messiah) and Mahdi. The Ahmadiyyas, through publications, sermons, and electronic media preach and develop ethical awareness in their membership. They have Muslim Television Ahmadiyya, a global 24-hour satellite learning-channel. Each Ahmadiyya household has a satellite dish installed and paid by the Ahmadiyya head office to receive its designated signal. The Ahmadiyya, a sect of Islam, is an international community with branches in Africa, North America, South America, Asia, and Europe. It is estimated that there are some 70 million members worldwide. It is very dynamic and well organized community. After the demise of its founder, the Ahmadiyya Movement has been headed by his elected successors -- Khalifas. The present Head of the Movement, Mirza Masroor Ahmad, was elected in 2003. His official title is Khalifatul Massih V.
In 1914, with the death of Mirza Ghulam Ahmad's successor, Nur al-Din—a prominent scholar of Qur’an considered the mastermind of the Ahmadiyyah movement by its opponents—the community split over doctrinal issues such as Mirza Ghulam Ahmad’s claim of prophet-hood. Muhammad Ali Lahori, (a leading scholar of Islam and founder of the Lahori branch of the Ahmadiyya movement), headed the splinter group, the Ahmadiyyah Anjuman-i Isha‘at- Islam, Lahore, known as the Lahori group, which regarded Mirza Ghulam Ahmad a reformer (mujaddid), not the prophet. This group was more liberal and closer to the mainstream of Sunni Islam, but also more aggressive in its outreach and more vocal in explaining its doctrinal differences with the parent group. Muhammad ‘Ali was the main force behind the literary and missionary activities of this group (directed to the converts to Islam not to the group itself), including the opening of new centers in Western Europe and North America. In Canada, this Jama’at (organization/ group) was initiated in the mid-sixties and was first registered with Quebec Government in 1976. 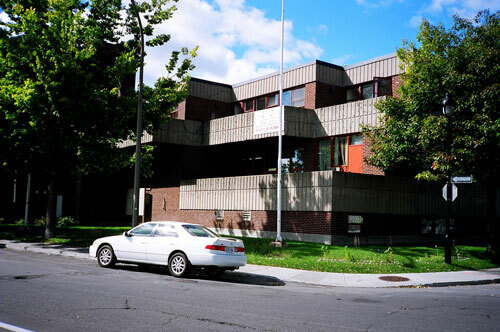 The first Ahmadiyya Centre was acquired in January 1982, located at 15,795 Gouin Boulevard West, St. Genevieve, Quebec. The community was small at that time and the building fulfilled the needs adequately. Over time, the community grew in numbers because of immigration from Pakistan. By the legislation introduced in the National Assembly by Z. A. Bhutto, Prime Minister of Pakistan in September 1974, Ahmadiyyas were declared to be non-Muslims. The immigration of Ahmadiyyas increased rapidly especially after 1984 when the President of Pakistan, General Zia ul-Haq, implemented the anti-Ahmadiyya Ordinance. The Centre became too small to accommodate all the new immigrants. 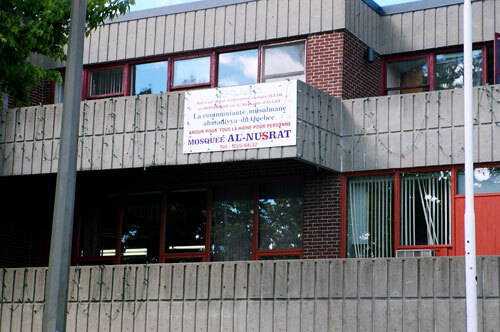 In December 1995, the Centre (Al Nusrat Mosque), moved to its present location on the shores of St Lawrence River. It is a large rectangular building, providing a panoramic view. There are two main floors overlooking the river and a basement. The three floors provide about 10,000 square feet of space, with adequate washrooms on each floor and wudu (ablution) facilities. The main floor is carpeted and is used for prayers and seminars. The second floor has classrooms, kitchen facilities, and four guest rooms. There are separate entrances for men and women. The Procedure of Elections: According to the Centre’s administrative rules and regulations, no member is allowed to campaigns for any position, especially no negative campaigning against any person is acceptable. The local general membership recommends the names in each area of responsibility by holding voting for each position. The appointments are confirmed by the national headquarters. Each appointment is for three years. There are also a number of auxiliary committees. The chairpersons of the auxiliary committees are appointed in the same manner as the office bearers, indicating a strong central link. However, the chairpersons can appoint their own working committees. Community meeting once every month and numerous other activities. Members participate in various activities such as religious training, learning of the Qur’an and ahadith, and Urdu and Arabic languages. Classes for children are also held in the areas they live. Interfaith seminars are held about 2 to 3 times a year on different religious topics. Non-Ahmadi Muslims, Jews and Christians are invited to participate and ask questions. Translation of Holy Qur’an (in over 100 languages). For further information and Ahmadiyya perspective, visit the websites on our datasheet. 1For more information and bibliographic references, see Sajida S. Alvi“Muhammad ‘Ali Lahori (1874‑1951),” The Encyclopaedia of Religion, New York, 1987, vol. 8, 423. Revised and expanded version in ibid. 2005.